To most Americans, the iconic Italian expression la dolce vita means the sweet life (its literal translation) or the easy life. Its English-language connotation with glamor and carefree living comes from the famous film by the same name, Federico Fellini’s 1960 masterpiece. In interviews that he gave in the years that followed its release, the Italian director repeatedly said that its meaning was widely misunderstood. The title, he explained, came from the final sequence of the movie when the main character, Marcello (played by Marcello Mastroianni), sees the little girl, Paola, whom he’d met earlier in the story. It’s daybreak and he’s on the beach outside of Rome, following a night of hard partying with his jet-set friends. He’s coming to terms with the fact that the world around him, the milieu bourgeois to which he belongs, is morally bankrupt and devoid of purpose other than self-serving personal fulfillment. But the sight of the beautiful, innocent child brings a smile to his face as he remembers — in Fellini’s telling — the inherent, abiding, and irrepressible sweetness of life itself. Watch the sequence here. You don’t need to understand Italian to follow the narrative. I was reminded of that scene yesterday when Tracie P and I went to pick up Georgia P (above) on her last day of preschool. 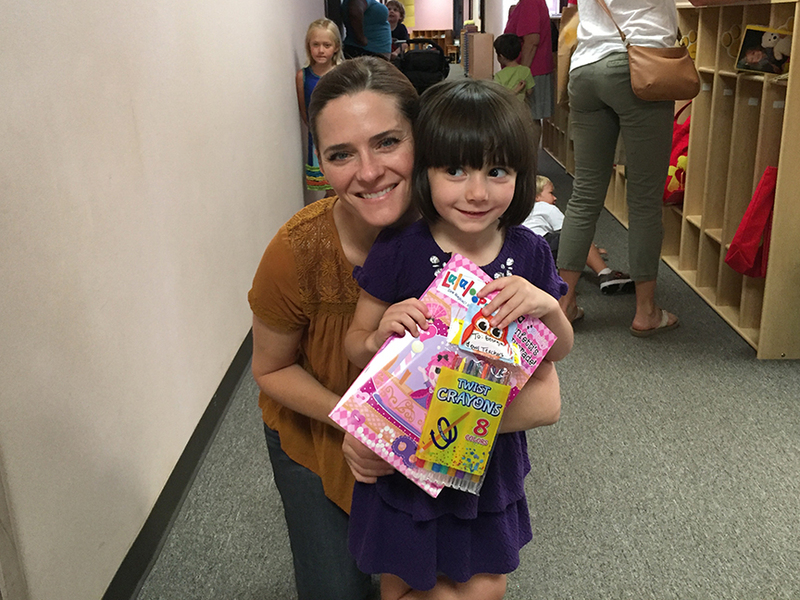 She’ll start kindergarten in September and she’ll turn six in December. Tracie and I both shed a tear as we reflected on this last day in this chapter of her life. She’s too little to understand words like “special counsel” or “collusion” or “impeachment” or “locker room talk.” She’s too young to ask questions about why the president of our country boasts of his electoral college results or the size of his hands. She simply wouldn’t be able to wrap her mind around why the president told the director of the FBI to go home or why the Senate majority leader has called for a little less “drama” from the White House. The buffoonery of the 2016 presidential nominating process and election has now carried over into the running of our country and the direction of our nation — there is no doubt about it, no matter where you stand. To you Trump supporters and loyalists, I ask: how do you explain this to your children? How do you explain that you voted for and support a man who’s irreparably degraded civil discourse in this country? How do you explain your faith in a man whose administration — running our country — is in a “downward spiral,” as a leading Republican Senator put it this week? What’s a downward spiral, daddy? Was all of this worth the wall on the border, the travel ban, the repeal of greater access to health care? How do you explain your embrace of moral bankruptcy for the sake of lower taxes for the wealthy and deregulation of big business? Smaller government and state’s self-determination are fair game in the political world. And I respect that. But how can you respect yourselves when you euphemize the Faustian deal you made with Trump to achieve those goals? My oldest child is only five years old and I still don’t have to explain to her the choice that so many of my fellow Americans have made when they voted for Trump. Maybe they believed that Trump would act differently in the White House. That clearly isn’t going to happen at this point. Maybe they believed that he would act as he has for his whole life and that was okay with them. Maybe moral rectitude is no longer an aspiration we should instill in our children. Tracie and I have a few more years ahead of us before we will have to explain Trump America to our children. In the meantime, the tears we shed remind us that there is a sweetness to life that no one, not even Donald Trump, can destroy. I am no fan of the current administration, but the explanation is quite clear. The people who sent President Trump to Washington, the people who voted for Senator Sanders (I’m no fan either although I think he’s far more tolerable) have a very clear message, “stop forgetting about us.” They’re right! We have made significant strides since the 1965 Civil Rights Act but we are generations from equally, we bailed out the auto companies but not the autoworkers, we keep striving for early 20th century jobs (think Chaplins’ Modern Times) when we need to be developing 21st century jobs, etc. The list goes on. I’m not talking Dems or Rep, Libs or Conserves, I’m talking about leaders leading, not following a poll. There are four people who have to unite to guide us out of this mess. Those folks are McConnell, Schmur, Ryan and Pelosi. Not my first choice either, but that’s what we have. So, to answer your little girl, every leader gets tested and how they respond is what determines how good they are. The same holds true for countries and Empires. Rome was tested many times before it finally fell. Now our country is being tested. We’ll see the results. I remain optimistic, as should you, for your kids sake. I loathe Trump – he is a threat to our liberal democracy, and is a would-be Erdogan. But the post from Tony is accurate – there are people in this country who feel (and in fact are) left behind and undermined by a tolerance for undocumented workers. I was listening to an NPR piece about the effect of ICE deportations and the fact that border crossings are at an all-time low. An owner of a landscaping company remarked that his competitors were complaining that they could no longer find workers. His sense was that this was a good thing because those other landscape companies were undercutting him with cheaper labor who were not legal to work in the U.S. The Trump election has exposed a tension between urban and rural; professional versus blue collar. Those of us who are faring well in this modern economy benefit from services provided by cheap undocumented labor – even if we aren’t hiring the labor directly, we benefit from cheaper construction/landscaping/food services, etc. Texas is a very good example. Housing in Texas is ridiculously cheap precisely because houses are built with undocumented labor who are not working in the U.S. legally. But we need to think about how this affects Americans, and their ability to earn a living. If you are the owner of a small business and try to play by the rules by only hiring Americans, then you will be undercut by your competition. NONE OF THIS EXCUSES TRUMP. The racism; the misogyny; the sheer ignorance; the love of autocracy. And the ENTIRE GOP is complicit in this disaster – indeed, they benefited from, and explicitly fomented, the white anger. But – no other politician was willing to speak to these peoples’ needs and fears. Certainly not HRC. Maybe Joe Biden or John Kasich, but not to the extent that would have mattered to their daily lives. The forces that propelled Trump to the Presidency should not be forgotten by both parties. No platform should be built around the Alt Right’s explicit racism. But both parties need to look deeper into needs of the broad spectrum of the American electorate in an attempt to re-balance the economic forces that are currently very much undermining the bottom HALF of the workforce.